On October 29th, 2011, Brandeis undergrads Lamia Harper (’12), Charity Frempomaa (’12), Sadrach Pierre (’13) and Carlos Pérez (’13) from our local SACNAS chapter represented Brandeis at the Annual Conference of the Society for Advancing Chicanos and Native Americans in Science (SACNAS) in San José, California. Lamia and Sadrach both received awards for their research poster presentations. Lamia, who works in the Paradis lab, won an award in the Cellular and Molecular Biology category for her poster: Gene Discovery: Protein Kinases that Affect Synapse Development in the Mammalian CNS. Sadrach, who works in the Thomas lab in Chemistry, was awarded under the Biochemistry category for his poster: Sulfoamide Boronic Acids as Inhibitors of Beta-Lactamase. Two Women in Science events this week. The Brandeis Chapter of SACNAS, in affiliation with the Science Club for Girls, would like to cordially invite you to the Fall 2011, Women in Science Panel. Join us this Wednesday, November 2 at 5:30pm in Volen 119 for a night full of professional development, networking, culture, and community! Interdisciplinary, inclusive, and highly interactive, the SACNAS Women in Science Panel offers an unparallel venue for discussion between women in science and science students. Come hear about the journeys of amazing female scientists, and learn how you can play a unique role in changing the status quo. 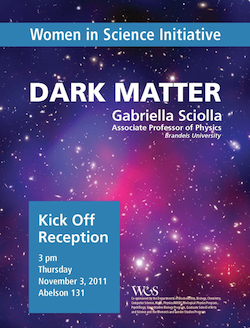 On Thursday, November 4, the Women in Science Initiative will hold a Kick Off Reception at 3:00 pm in Abelson 131, where Associate Professor of Physics Gabriella Sciolla will talk about Dark Matter. As an appetizer, you can read more about the rich history of Brandeis women in science in a new story at BrandeisNOW. On March 26th the Brandeis SACNAS chapter will be holding their 2nd Brandeis SACNAS Chapter Symposium 2011: Fostering leaders into a new scientific generation. This year, we hope to expand our circle of influence even farther as we look forward to hosting students and mentors from Brandeis and other institutions in the greater Boston Region. We want to create a forum for students to network and learn about the different pathways that the sciences have to offer. This year we will have Dr. Daniel Colon-Ramos, Assistant Professor of Cell Biology at Yale University, talk about his journey from early undergraduate to PhD. Dr. Jim Morris from Brandeis will discuss his track towards earning his MD/PhD at Harvard Medical School. Lastly, we will also hear from our own chapter President Kerwin Vega, fourth year undergraduate, as he speaks of his first steps towards pursuing a career in science and his networking experiences thus far. We will also host a Career Development Panel where professionals from various scientific backgrounds will briefly speak of their personal professional anecdotes as well as answer any questions. There will also be a poster session for students to present their work. For the past six years, Brandeis has been participating yearly at two undergraduate-oriented conferences in an effort to recruit the best minority students for the life sciences graduate programs. These two conferences are: SACNAS (Society for advancing Hispanics/chicanos and Native American in science) and ABRCMS (Annual Biomedical research conference for minority students). This year SACNAS was held at Anaheim, CA during September 30 and October 3. Professor Jim Morris and 2 graduate students represented Brandeis and interacted with post-docs, graduate students, pre college teachers, undergrads and other 300 exhibitors. The theme of this year conference was Science, Technology & Diversity for a Sustainable Future. 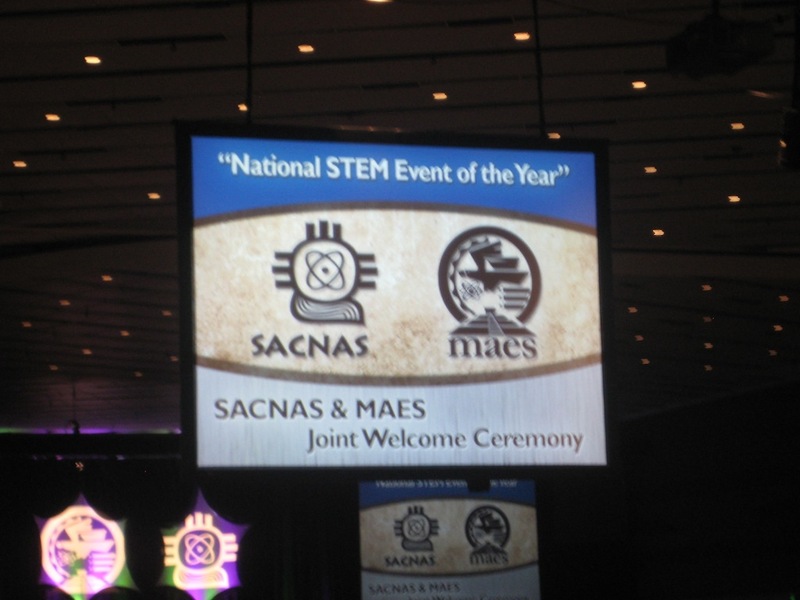 In addition, SACNAS combined efforts with MAES (Society for Mexican American engineers and scientists) in order to make the experience more interdisciplinary. For the past 30 years SACNAS has been holding this conference to enforce the underrepresented minority population in science to pursue advanced degrees, careers, and positions of leadership. 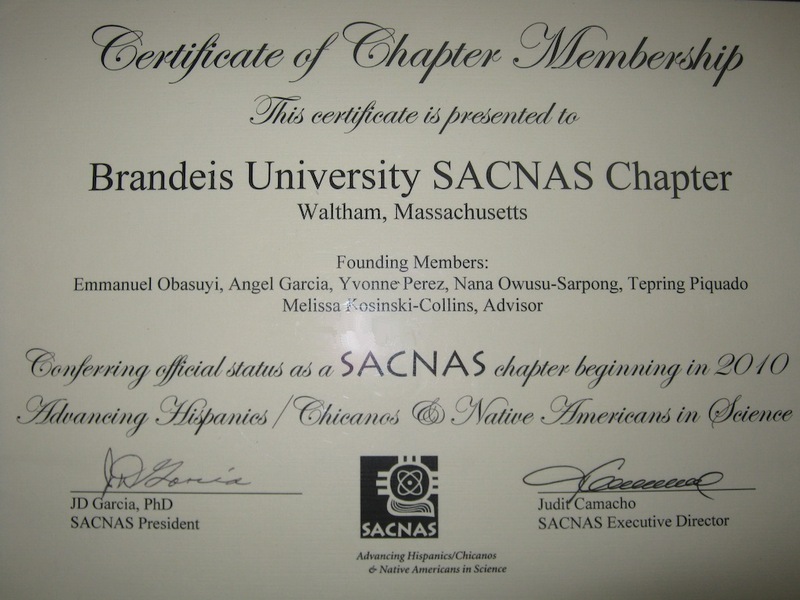 A Brandeis SACNAS chapter was created over a year ago, in order to provide information and give access to professional tools to all the undergrads interested in pursuing careers in science. This year, the Brandeis SACNAS chapter was recognized during the meeting as a new chapter, and 9 of our undergraduates participated in the conference; 2 of them Angel Garcia and Kerwin Vega, presented their research in the poster sessions. You can also connect with the Brandeis chapter on Facebook. SACNAS (Advancing Hispanics/Chicanos & Native Americans in Science) is a national society with a 37-year history of supporting minority scientists and science students. SACNAS members are dedicated to giving back through mentorship, peer networks, and professional development, and to engaging in science research and leadership of the highest caliber. The organization and its members and affiliates are committed to encouraging minority students and scientists to advance to their utmost capability. The Brandeis SACNAS student chapter will be hosting the Greater Boston SACNAS Regional Meeting on Saturday, April 24, 2010. All SACNAS members, and those interested in SACNAS and promoting diversity in the sciences are invited to participate in the regional activities. This dynamic meeting will feature talks by Brandeis professors from the sciences, outside guests, an alternative careers panel, student speakers, a networking lunch and a poster session. Registration is required to attend. 9 a.m.-6 p.m. We welcome all to attend (undergraduate, graduate and post-doc, and faculty). Please click here for more information and to register.